There are many companies that promote work-life balance, but not all of them deliver on their promise. However, companies like Nike make this a priority. “What if there were a way, without being an athlete, to feel what athletes feel?" said Phil Knight, co-founder of Nike. “To play all the time, instead of working? Or else to enjoy work so much that it becomes essentially the same thing." Work-life balance is embedded into Nike's DNA and lifestyle. It's in the innovative perks offered on campus that encourage sport, play, and balance. It's in the culture, and how people treat each other. Nike employees collaborate with some of the most gifted athletes in the world. These brand ambassadors inspire and motivate athletes to reach their best potential. Nike has aggressive goals to help change the future of sport. While employees at Nike work hard to achieve these goals, they make time to play too. "Nike is a company with a team mentality that celebrates each other's successes and continues to push everyone to be the best athlete* they can be," said Bryan Hamilton, Recruiter for Air Manufacturing Innovation Team at Nike. "Where else can you win the opportunity to play kickball with LeBron James, shoot hoops with Kevin Durant, or throw a football with DeShaun Watson? I love working for Nike! My friends can't believe some of the day-at-work stories I tell them!" Nike rewards its employees with a chance to meet the athletes they admire. It's opportunities like this that spark creativity and inspiration amongst employees and get them excited to come to work every day. Meditation has become a mainstream way for people to reduce stress and promote a positive mental state. According to a study conducted by Aetna that tested the effectiveness of a mindfulness training program, participants reported a 28% reduction in their stress levels. Practicing meditation while at the office allows employees to focus on their personal wellness and mentally regroup before returning to work. "It can be easy to focus so much on physical activity for the body that sometimes we forget to exercise the mind. Nike is committed to our total wellness. I started meditating almost two years ago (thanks to my wife)," said Bjorn Anderson, Recruiting Manager at Nike. "Meditation has transformed my life both personally and professionally, in only three minutes or less per day. The Mindset Conference that Nike held on campus with Headspace last year was a powerful event. Nike pays for a yearly subscription to the Headspace app for full time employees, helping us create micro-moments of awareness throughout the day!" 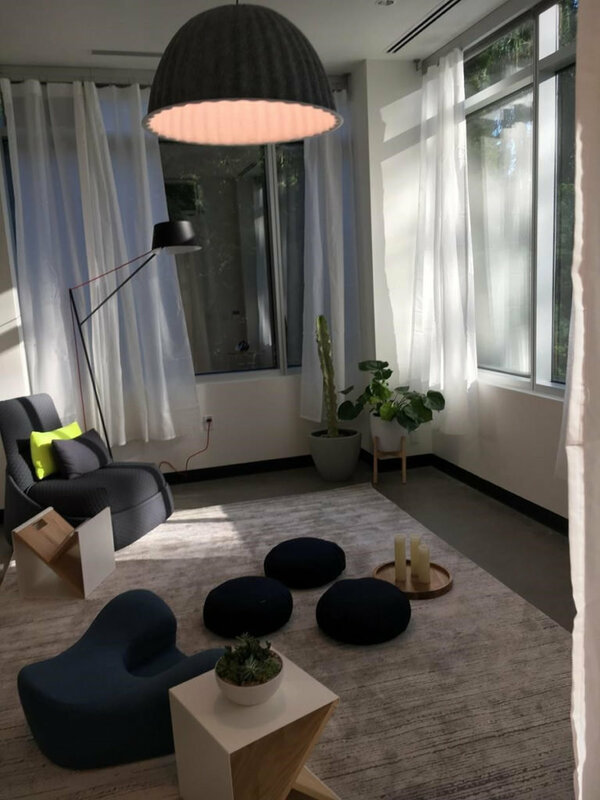 Meditation rooms on the Nike campus invite employees to reduce stress, relax and regroup. Nike employees "create micro-moments of awareness throughout the day" with meditation spaces and subscriptions. When summer arrives, all we want to do is hang out at the beach and spend time with family and friends, right? Well, for a lot of employees, they're in the office continuing to work until the weekend begins. Some companies, however, offer Summer Fridays to help kickstart the weekend early for their employees. Kathleen Nering, Senior Talent Sourcer at Nike, said she always loved summers as a kid. For her, growing up, they were synonymous with fun, freedom, and family. As a working adult, she longed for what summers used to be. That all changed when she joined Nike. At Nike, Summer Fridays last from Memorial Day to Labor Day, where the company shuts down at noon on Fridays. "I spent my summers as a kid swimming at the local pool, fishing with my grandma, picking watercress in the creek near her farm. Summers were a chance to put the books down and change it up for three full months. I've spent 25 years in the workforce, and each year those same three summer months have come and gone, and with them a feeling of nostalgia for what summer used to be," said Nering. "Once I started working at Nike, the spirit of summer swept back in for me, a feeling of joy. Now I'm getting more out of summer again, more free time open to possibility." She said she enjoys taking her son to the pool on Fridays, and concocting road trip plans with her husband. These activities are made possible with the extra time she has thanks to Nike. "It's a chance to enjoy long weekends every weekend," she said. "This extra free time has an amazing domino effect on our lives that we can't quite quantify; it does so much good!" Summer Fridays help increase productivity and boost employee morale. In fact, according to a study by Opinion Research Corporation, 66% of those surveyed felt more productive as a result of the summer hours policy at their companies. Not everyone has the luxury of leaving the office early to enjoy some fun in the sun during the summer months. Fortunately for Nike employees, this is something ingrained in the company's business model. Nike leadership acknowledges the intrinsic and business value of balance. Nike leaders see employees as whole people. They know there are critical things people need to take care of outside work, such as taking a child to a doctor's appointment or attending an afterschool activity. Jennifer Favors, Talent Acquisition Manager at Nike, dealt with a life-changing moment and shares how Nike supported her through it. "I have six kids, so I'm always juggling work with the rest of my life," said Favors. "At Nike, nobody flinches when they hear a kid in the background during a conference call." Last year, her son was in his classroom at Marjory Stoneman Douglas High School during the school shooting tragedy. It was 2 p.m. and Favors was leading a conference call from her car only one mile away. She got phone calls and text messages from her son and her husband while she was on the call and figured she would get to them after the call. Then, she noticed police cars flying by. She quickly ended the call. That's when tragedy struck. Her son was in the third classroom that was shot up, he was hunkered down, but he was safe. "That shooting was uncharted territory," she said. "My phone flooded with people from Nike who reached out to check on me, many were company leaders and people I'd never even met. The support was tremendous that day and during the following weeks. Life is about relationships. Nike is about family. I've worked for other well-recognized brands and I can tell you, I will not leave Nike for anywhere else." For some companies, work is about coming in, doing a job, and leaving. Nike offers so much more than the average employer. It has created a family-like atmosphere where employees feel supported and cared about. Today, employees want to work for companies that support causes they care about. Denise Novosel, Recruiting Senior Director at Nike, lost her mom to Alzheimer's at the age of 71. At her mom's funeral service, Denise made a commitment to honor her mom's legacy and share her story. "Alzheimer's didn't define my mom's life, but her journey taught me about patience, empathy, and courage. It has also inspired me to help fight for others who are impacted by this terminal disease," said Novosel. Nike recently supported Denise when she wanted to donate to an Alzheimer's Association charity event where experiences were placed for auction. Because of Nike's generous contribution, Denise donated an experience for a group of people to enjoy dedicated time at the NIKEiD studio in downtown Portland. Each person got to customize a pair of sneakers and make their own color choices on the base of the shoe, laces, swoosh, pull tab, even in some cases put their name or other text on their shoes. According to Novosel, her commitment to supporting other families affected by Alzheimer's remains unwavering and it's one of the reasons why she loves working for Nike so much. "The best part is that I made a new friend at the auction," said Novosel. "Jon, who won the NIKEiD studio experience, has since lost his father to Alzheimer's. We've created a lifelong friendship, one that I wouldn't have without Nike." We all know actions speak louder than words. It's actions like this that show Nike leaders truly care about making a difference in employees' lives. Veterans are used to wearing many hats and at Nike it's no different. Many veteran employees at Nike balance their continued service while pursuing careers in support of Nike's mission – to bring inspiration and innovation to every athlete* in the world. As a recruiter for Nike, Yuri Kim leads recruiting projects to find talent aligned to logistics, planning, supply chain and distribution. When the time comes for her US Army Reserve duty, Yuri leverages Nike's Military Leave Benefit, providing up to 12 weeks of paid time off every year. "The new Nike military leave benefit has really helped me and my family," Kim said. "I'm able to attend my military duties with a peace of mind that I can take care of my family financially and still come back to a job I love." 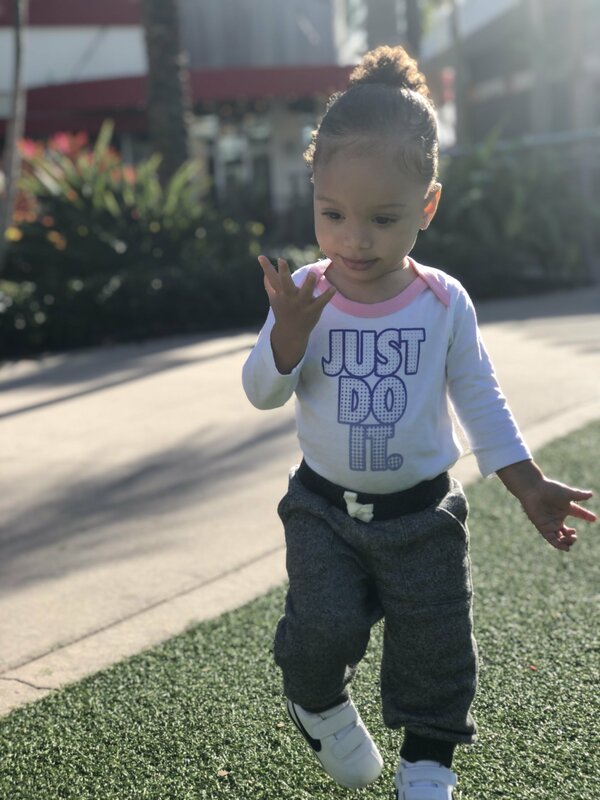 After six years of trying to conceive, and the loss of her first child, DeAndra Brown, Athlete Talent Attraction Coach at Nike, and her husband received even more heartbreaking news, and it was during her first week of working at Nike. DeAndra's doctor told her she would be unable to conceive a child naturally. Devastated, she went to work, and her manager noticed something was wrong. "My manager pulled me into the office," Brown said. "Through tears, I told her the painful news. She listened and then explained that Nike's benefits would help me have the surgery I needed to make my crazy dream come true." DeAndra immediately followed up with HR. After months of shots, surgeries, and a lot of prayers, support, and faith, she now has a healthy one-year-old daughter named Myla Bella. Her name means "Merciful Beauty." "People know the brand, but they are unaware of how sincerely the brand cares for its people." "As a recruiter, I tell this story every chance I get because people know the brand, but they don't know how sincerely the brand cares for its people," she said. "I tell candidates that what's important to you is important to us!" Chances are, if you don't work for Nike, you probably didn't know how full in Nike is on balance. But it makes sense, right? Sport is balance. It goes back to what Phil Knight envisioned for his company, that employees would work as though at play. Learn more about the Nike Employee Networks here. And how the company invests in its employees here. Interested in joining a company that understands, prioritizes and cultivates work-life balance? Take a look at Nike's open positions!